"You have a life-threatening condition and here's proof" is not what I wanted to hear from the Spokane heart and lung consultants I had been sent to. I wanted to hear that my recent lack of stamina for ordinary things like walking two or three blocks was something insignificant, something that a little pill, purple or otherwise, could whisk away, like so much Palouse dust on the grand piano during harvest. I wanted to hear that my cold and its accessory cough that had applied for social security benefits was just a bad virus and with the proper treatment would sink into the recesses of memory, as my 2002 virus finally had. Last year's viral dance with the medical industrial complex produced a preliminary diagnosis of congestive heart failure and a flurry of actions, one of which almost sent my kidneys south. That experience left me thoroughly unimpressed, switching the farm team in 2002 and intent on trading up for the 2003 season. I was prepared to hear that I needed to reduce the stress in my life, lose some weight and get more exercise, the same old 'yadda yadda' that I had been hearing for about thirty years and paid sporadic attention to. No, to be honest, make that " largely ignored." Instead, on the day the United States was getting ready to oust Saddam Hussein, there I was, hearing Dr. A, the heart man, saying " This is really serious. I'll bet you haven't heard this much in your life: you flunked all the tests." I concurred. Set the scene. My regular blood pressure was very elevated. I had a crummy cough and a voice that sounded about as melodic as Central Pre Mix gravel being made into sidewalk material. I was sure that my days were numbered by this lousy cold. But I had no clue that most people walk around with pulmonary arterial blood pressures of around 14, that 25 is considered high and that my pipe came in at 90. Oxygen saturation rates were far below normal.
" You should be dead…" I replied that such sentiments had sometimes burst forth from opposing counsel or their clients, particularly in matrimonial cases, but rarely in other settings. Dr. A patiently kept at it. " Linda, you need a Pullmanologist…" My retort was that I knew everything there was to know about Pullman, Washington, having lived just over the border for more than thirty years and having had a very intense relationship with the place. " No, Linda, a pulmonologist… it's not about the town; it's your lungs." Oooh. I questioned Dr. A about the earlier diagnosis of congestive heart failure. It turned out that my heart was a trooper and if it hadn't been, the memorial service would have long since concluded. Dr. A referred me to Dr. B, the pulmonologist. I went reluctantly. Dr. A was my kind of professional. If he did not have a complete answer he said so and showed his patient where he would go to get the answer if it were available. He talked with, not over or at, his patient. Would this lung guy measure up? Dr. B, the pulmonologist, met and examined me the following Monday. I kept trying to sell the " it's just a dry cough from the regular high blood pressure medication" theory in various guises. I pushed the " surely there's a purple pill that would take care of this" since TV and the pharmaceutical reps are so intent to convince us of this. I had heard what Dr. A had said and I didn't like it one bit. I didn't want ANY life threatening disease, period, and I wasn't going to take it. So there! Especially from a guy who deals with lungs… What kind of career choice is that… he could have been a surgeon, instead. Diagnostic efforts resemble forensic examination, a la CSI, only the victim is across the desk from you, at least for the moment. Are you an intravenous drug user? The way I feel about needles? I may be the only person alive for whom the death penalty by lethal injection actually is a deterrent. Ever use the diet drug, Fen-phen? Come one, Doctor: take a good look. Do you think I'm into diet drugs? No. Carefully and completely, Dr. B sorted through my medical history, tests, offers of proof for other medical options, anxiety and jokes, coming to the provisional diagnosis: Primary Pulmonary Hypertension. Provisional became definitive: I have primary pulmonary hypertension. Instead of the lottery of money, I won the lottery of disease. The frequency rate is two per million people. It is remarkably equitable, affecting all ages and ethnic backgrounds. Untreated, people with PPH have a very short shelf life. It's a terminal disease. Treated, people last longer and, thanks to research, better drugs, treatment and general information about PPH, still longer. Yes, there is a Pulmonary Hypertension Association and I've already hit the halls of Congress on their/our behalf. If doctors know more about this disease, they can identify, refer and treat patients more quickly and effectively. Any advantages to Pulmonary Hypertension? Thus far, three have materialized: (1) the day off in the ICU; (2) being able to visit two savvy, good looking doctors on a periodic basis who seem genuinely interested in my cognitive capability and (3) the crab louie at the Davenport Hotel. I'm not sure how the City of Spokane can use its excellent medical facilities for this kind of tourism. " Come get your terminal diagnosis in Spokane…"
What did I do with all this information? I thought about running red lights and finally telling some particularly annoying people what I really thought. I quickly dismissed this idea because with my luck, I would then have a complete cure that would mean ten years of hard explaining and apologizing to do. Instead, I returned to Moscow, looked around, thought about running again for City Council and invited my best friends over to dinner at my house. I am now dragging Ralph, my oxygen bottle, around, thanking WSU for having such good medical insurance so that I can afford the horrendously expensive prescription medication, and looking a little more closely at sunsets and lilacs. I have turned off the " telling off impulse and redirected it. I am, instead, taking every opportunity to tell people how much they mean to me and what gifts they are to my life. I try to do this accurately, simply and with a minimum of the morose. So far, so good. As the Bee Gees said so elegantly, " Stayin' alive, stayin' alive." Lester Jensen underwent triple-bypass surgery a little more than a year ago. After being tethered to an oxygen machine for three months and enduring several relapses during a long recovery period, he stabilized and decided to take control of his recovery. And so did his wife, Betty. They enrolled in the MCMC's Cardiac Risk-Reduction & Rehabilitation Clinic, a program for heart disease patients and their supporters. 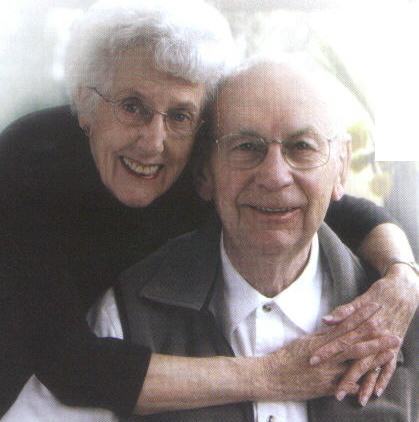 "Initially, I was having trouble even standing up without being dizzy," Mr. Jensen recalls. "When I could move around, it was very limited and I could only walk the block in front of my house." "My wife was really the driving force behind my motivation and recovery efforts," says Mr. Jensen. "And I give the program credit for helping me regain a lifestyle that is healthy, productive, and enjoyable..." Betty says her husband was dedicated and never wanted to miss a day of the program. Even though the Jensens are very disciplined, the doctor said they could still enjoy one of their favorite weekly traditions. "We like to go out for a bowl of clam chowder on Friday nights," Betty says. He is a truly lifelong gift and inspiration. For that we thank him and give him our love and respect. For the past two years, I have painted fabric for "dolly quilts" for the non-profit Latimer Quilt & Textile Center's Silent Auction. This is part of the annual High Tea in December and our main fundraiser for the year. Aritisans create quilted wallhangings, woven pieces, tatted items and even some highly creative entries from papermaking. My donations the first year were mainly Christmas-themed, last year was wildlife (with a couple of black and white prints of raptors donated) and this year the theme is Noah's Ark. So of course, Two by Two came to mind. I do the fabric painting and a very talented friend - Cathie Favret - finishes them off by sewing on a border and quilting them. When the bidding is about to close, near the end of the tea, there is a rush to hog the signup sheet next to the desired piece. The pieces Cathie and I have done have been fetching anywhere from $55 to $95, so of course our egos are pleased. If anyone would be interested in bidding, the painted ones begin at $25 and go up by $5 increments. I would be just pleased as punch to put up any bids. (Hey, hope springs eternal.) At any rate, for those who have asked "So what have you been up to....," this is way more interesting than describing day to day activities of caring for an aging parent. Petroglyphs..... The explanation from our sales form is below... we are tickled because we have sold over $1,000 worth in just a couple of months! At wholesale prices mainly, too. Klindt's Booksellers has it as does the Discovery Center. I was very pleased that we could use Mom's sketches in a positive way. She is pleased to see the finished product as well. I tried my best to relate the proper history, although I am sure someone will squawk over something. Too bad. Geez, I even did research! 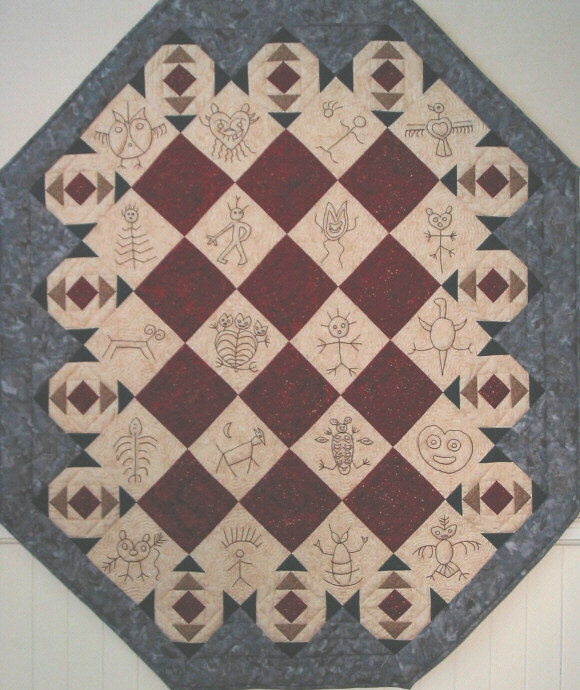 The Latimer Quilt & Textile Center is pleased to announce the availability of Petroglyphs Along the Columbia River, the second in a series of publications. This book features 28 redwork patterns. 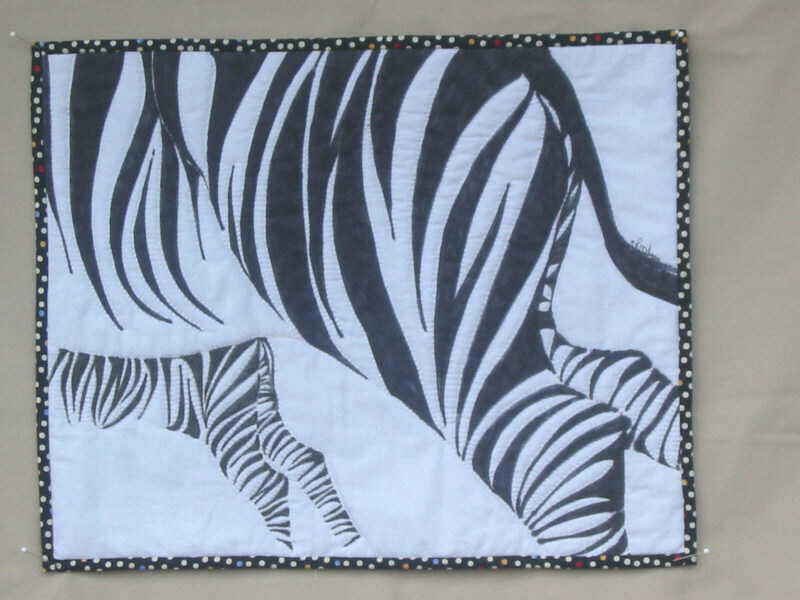 The design of the over-all quilt is left to the discretion of the artisan. Professionally produced, this second publication features patterns taken from sketches made by Cecile Colcord in the mid-1950s. Learning that the construction of The Dalles Dam would inundate many petroglyphs along the Columbia River, Cecile made rubbings and sketches of as many etchings as could be reached. Thirty years after passing her sketches on to her daughter, Cecile has seen these drawings of Native American petroglyphs adapted to redwork embroidery patterns. It is her hope that this publication not only produces revenue for the Latimer Quilt & Textile Center, but sparks an interest in the native peoples that lived in the Pacific Northwest thousands of years before the white man appeared on the scene. The Latimer Center has copies available for its visitors. The book features a coil binding, allowing it to lay flat for convenience. Diane Colcord and Cara Wheeler Carr did the "London Experience". As described to me, they reported to a 1910 house in portland, home of "Alyce", at 9:30AM to pick out their costumes. They then piled into a vintage automobile to ride to the Benson Hotel in Portland for an elegant brunch, and to have their pictures taken on the grand staircase at the hotel. 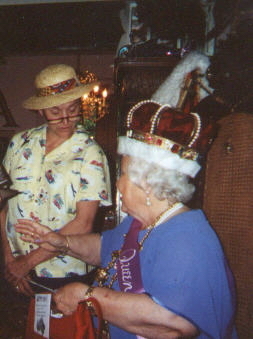 The trip coincided with a celebration for a friend, Betty Perry, being named "Queen Mum" of the PDX area. 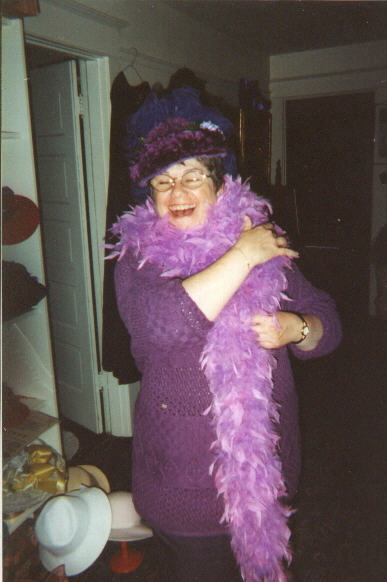 "It's not too much glitz unless you fall over"
Betty Perry also has a web site, where you can learn more about Diane and Cara's friend. Marti Bradley has a distinct recollection of her first adventure in cooking. She was about 7 and wanted to make herself of cup of cocoa. This was in the old days, before genetic engineering and instant hot chocolate. She did fine measuring and mixing the cocoa powder, sugar and milk. But then the directions called for a dash of salt. "I didn't know what a dash was so I thought they meant a dish," Bradley said. She never cooked again until she had to, and that wasn't until she was married with kids. Later, when she was unmarried with kids, it became critical to make cooking an event to celebrate rather than dread. "When you're alone and going to law school, with two kids and no money, you have to make do with what's in the cupboard. And you have to work to make it interesting." Bradley overcame her initial misadventure in the kitchen to become a fearless and creative cook. So when she stumbled upon an entry form for the 44th National Chicken Cooking Contest on the Internet she thought, what the heck. She's always inventing recipes anyway, so she sent one in. And then she found out she was Alaska's winner. "I was like, 'Huh?' I mean, I sent it in on a lark." As a finalist, Bradley got a trip to Sacramento to compete with other winners from all 50 states. "First prize is $25,000," she said. "Imagine, $25,000 for cooking." Her contender was a dish she calls "Poky's Pasta." Poky is the nickname of her daughter, Christa, 32, who lives in San Jose, Calif., and Poky's Pasta is Poky's favorite. "When she comes home that's what she asks for," Bradley said. "And it had better be prepared, hot and waiting when she comes in the door." For contest purposes, Bradley dubbed her recipe "Chicken and Sweet Onion Pasta" because she thought that sounded better. The chicken people didn't think so. They renamed her dish yet again. It's now officially "Chicken with Linguini Florentine." Bradley, who raised her family working as a criminal defense investigator in Fairbanks, owes her creative ways to being a single mom with the desire to see kids eat what was put in front of them. Sometimes salesmanship was enough. It was never plain old oatmeal; it was Goldilocks' porridge. And spinach? Forget it. That would be florentine. "You have to use your imagination -- and lie," she said. "This is not moose stew. This is French Ragu." She may have gone a little over the edge on holidays, though. Like on Valentine's Day, everything would be pink, on St. Patrick's Day, green. "We'd have green pancakes, green French toast," her daughter, Christa, said. "I think the green homemade bread made into green tuna fish sandwiches didn't go over very well with me. I remember looking into my bag riding the bus to school and going, 'Ah, thanks, Mom.' "
These days, with Bradley's kids grown and gone, she works as a care coordinator with Medicaid's CHOICE program, keeping the elderly and adults with disabilities living as independently as possible. She's a volunteer with Alaska Court Appointed Special Advocate (CASA) Program and leads a support group for people with Huntington's disease. At Halloween, she carves pumpkins -- like 60 of them -- then gives them away to nursing homes and such. 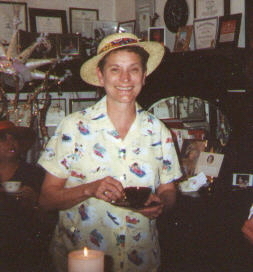 On top of all that, she puts in a day a week as a volunteer social worker at Bean's Cafe. After learning she was a contest finalist, Bradley celebrated by buying enough ingredients to feed 300 people and cooking up her recipe for those at Bean's Cafe. The Foster Farms chicken people got wind of it and asked her to do it again, providing 600 chicken thighs for the job. Bean's manager Big Al Wells said he knew Bradley's Chicken with Linguine Florentine was definitely a winner, at least among the homeless, because he saw so little of it after it was dished up. "I know it was killer," he said at the end of the meal. "All I have to do is walk by the trash cans. On any given day you can look down in there and know they must not have liked that salmon casserole or whatever." The cook-off, sponsored by the National Chicken Council and the U.S. Poultry & Egg Association, was last week. Bradley didn't win the $25,000. But she did win sixth place and lots of prizes -- cookware, knives, a stuffed, 4-foot-tall Foster Imposter Chicken. She also got a sash and a cheesy tiara out of the deal. She's threatening to wear this chicken princess outfit Friday at Bean's and make everyone sing "Hail to Miss Chicken Alaska." She'll probably do it, too. Daily News reporter Debra McKinney can be reached at dmckinney@adn.com. Lynn Harmon recently went 800 miles out of his way to pay me (Jim Chapman) a visit on Easter weekend, prior to going back to the Boston area for the marathon and to get together with Joe Lawrence and John Miller. 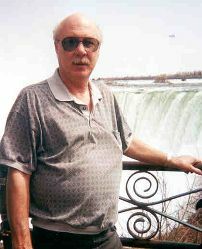 We had a great couple of days, taking in the small town of Pavilion, NY, from where his family emigrated to Utah, downtown Buffalo, and a pleasant lunch in Niagara Falls, Canada, with a great view of the falls. I look forward to a detailed account from his perspective to grace these pages soon.!! !